As brokers, we are asked just what is EPLI (Employment Practices Liability Insurance)? EPLI Coverage will protect your company against a claim filed by an employee of your company alleging their legal rights as employees have been violated. With the current employment status in today’s business climate, now, more than ever, Las Vegas/Clark County, NV employers have found this type of insurance a very valuable part of their insurance program. Lawsuits filed by employees against their Las Vegas/Clark County, NV employers these past few years have been on the rise, and, according to industry experts, will grow more frequent and larger in the future. As an employer, please take note that over fifty percent of EPLI claims filed by employees are directly linked to employment practices such as discrimination, harassment, and wrongful termination. Many times, a litigation such as this can severely cripple a company, especially when you consider what the legal fees and any settlement amounts can do to a company’s bottom line. Employment Practices Liability Insurance can provide coverage for claims arising from such things as Title VII of the Civil Rights Act of 1964, The Americans with Disabilities Act, the Age Discrimination in Employment Act, The Equal Pay Act, The Pregnancy Discrimination Act of 1978, The Immigration Reform Control Act of 1986, and The Family and Medical Leave Act of 1993. When determining what the cost will be when considering EPLI coverage, there is no standard pricing of these policies. The pricing will depend on such factors as the number of employees your company has, what type of industry your company is in, and other risk factors such as whether your company has any EPLI claims filed against it and how much was paid out in claims for employment practices in the past. The cleaner the record, the better the rates will be. By acquiring a Las Vegas/Clark County, NV Employment Practices Liability Insurance policy, you are protecting your business against the costs of defending a lawsuit in court and for judgments and settlements. By having an EPLI policy, it will cover legal costs, whether your business wins or loses the suit. Please note that, typically, EPLI Policies do not pay for punitive damages, or civil, or criminal fines. Generally, EPLI policies are written on a claims-made basis, and defense payments may reduce the policy’s limits. Also, EPLI policies can be written to include third party coverage for claims arising from legal conflicts with your employees and your customers or vendors. 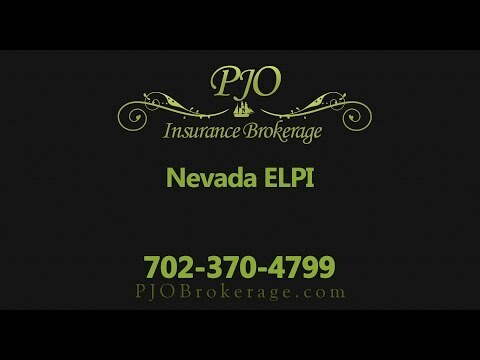 If you would like to explore how a Las Vegas/Clark County, NV Employment Practices Liability Insurance Policy would benefit your company, please call the experienced and professional brokers at PJO Insurance Brokerage.